UAE superyacht builder Gulf Craft has shared more details of its new build underway the Majesty 155, its largest yet, during a press event at the Monaco Yacht Show. The 155 will be powered by twin engines at 1,930hp and achieve top speeds of 16 knots with a 4,200nm range. 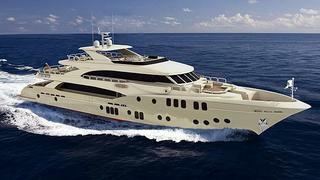 The yacht is scheduled to launch end of first quarter 2015 and be ready to show that summer. Bamps said that Gulf Craft is growing and the builder is looking to expand with a fifth yard – currently the Gulf Craft has four in UAE and one in the Maldives. 'We said once we wouldn't go over 50-metres, but we have already surpassed that, so not sure where we could go and what we'd build in the fifth yard.' Maybe even larger yachts to be announced yet from Gulf Craft in the future, but for now, stay tuned for more information and interior images on the Majesty 155.